I used to love science fiction. The trouble is that it simply became too believable to be any fun anymore. Space travel? Sure, everybody knows that’s possible, and thanks to Industrial Light & Magic, we all know what it will look like, too. Multiple universes? That’s almost received dogma in physics these days, and it’s made it into Scientific American, not once, but twice! You can turn on your TV and watch “Fringe” if you want to have an adventure in the universe next door. Yes, it has gotten really hard for a person to have a good time these days. So I was thinking, maybe I should sit down and write some uplifting cryonics science fiction. You know, the kind of really unbelievable stuff that get’s your pulse pounding and respiratory rate up – when you’re not holding your breath, that is! Because there sure isn’t much that’s very escapist or uplifting here on Chronosphere most of the time. The question is, am I up to the task? The good ideas have already been well exploited by literary talents far greater than mine, and it’s hard to find inspiration for “the almost impossible” from the advancing front of science, these days. Or so I thought. Then I came across a remarkable new discovery, one made just this year, in fact. It turns out that there are two Alcors! That’s right, the “star” we’ve called Alcor for about 500 years years is really two stars. One star is your run of the mill M-type star, and the other is a small, dim red dwarf star about one fourth the mass of Sol. There is thus an Alcor-A and an Alcor-B. Wow! That really got me thinking, what if there were an Alcor-A and an Alcor-B cryonics organization? Of course, we know all about Alcor-A, because we can see it. 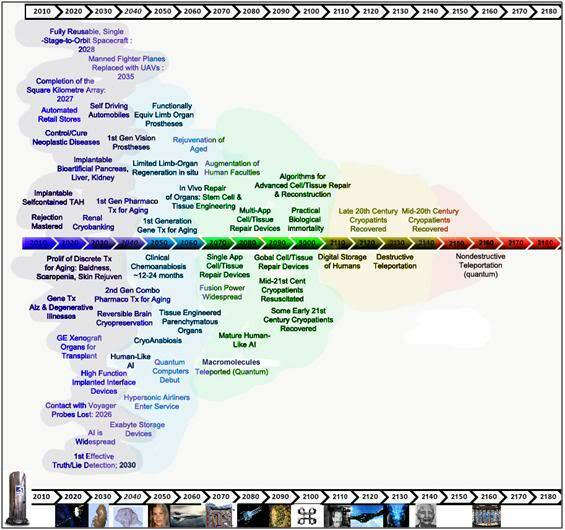 It’s everywhere; on TV, on the Internet, everywhere we look for information about cryonics. But what if there were an Alcor-B, sort of an alternate, utterly fantastical and impossible Alcor? An Alcor that could say, take $20 million dollars over 20 years or so, and, and…what? Well, in order to find out the answer to that question, you have to read my story. Now let me warn you that I’m not much of a story teller. My story is one of those newfangled ones, which has no beginning, no middle and no end! It’s just a press release by an alternate Alcor, Alcor-B. Alcor-B may seem much like Alcor-A, but I assure you that any resemblance is purely coincidental. They are enough alike, however, that I was able to use pictures, illustrations and the like from Alcor-A, to tell my story, and for that I am very grateful. Similarly, I do what most science fiction writers do. I build heavily on existing science. Even though my story is utterly incredible, indeed completely impossible (like time travel or faster than light travel), I need the real science to try to persuade my readers (you) to suspend your disbelief just long enough to read the story through, and hopefully to thoroughly enjoy it. My premise is simple. Just a few days from now on 06 August, 2011, in a universe much like ours, a cryonics organization called Alcor-B holds a press conference and makes the following announcement. Regrettably, due to constraints on data transmission between adjacent universes, all we are able to retrieve from that event is the media handout. And so, without further ado, here it is. Figure 1: The Alcors are the second, smaller and dimmer companion stars to the Mizars, the bright stars that comprise the crook in the handle of the Big Dipper constellation. In the Arab world of the 5th Century CE, Mizar’s much less bright (and more difficult to see) companion stars, Alcor-A and Alcor-B, were used as tests for good vision. Only someone with the clearest and most acute vision could see the Alcor’s. 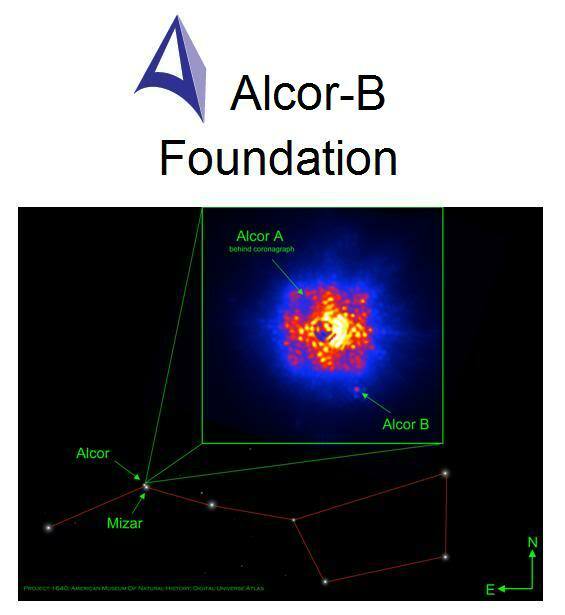 Alcor-B was discovered early in 2011 using Project 1640m, which makes use of the Hale Telescope’s adaptive optics system. Project 1640 gives the Hale a view almost equal to what is possible in space with the Hubble telescope. The instrument also has the ability to block out the light of a star, allowing faint objects located next to a star to be seen. The Hale, armed with Project 1640, was pointed at Alcor earlier this year and found that it isn’t a single star. Alcor has a small stellar companion that hadn’t been seen before: Alcor-B, a small, dim, red dwarf star about one fourth the mass of our Sun. To see Alcor-B you must have the superior vision that only mastery of the most sophisticated technology allows. Alcor-B is thus a test for the clearest and most acute vision – vision capable of seeing things as they really are – not just as they appear to be. Over the past five years the Alcor-B Cryobiology Research Foundation (Alcor-B) has been working to develop a fundamentally new and profoundly improved human cryopreservation technology platform. We have expended $3.5 million dollars on this effort and what we have developed is nothing less than a quantum advance in the quality of cryopreservation now available to Alcor-B patients who present for treatment under optimum conditions. Figure 2: At left, above, is a light micrograph (400x) of the molecular layerof the rabbit cerebral cortex subjected to freezing to -79oC in the absence of cryoprotection (straight freezing). The tissue is compressed between blocks of ice that have osmotically extracted the intracellular water. At right is the molecular layer of rabbit cerebral cortex tissue (10,000x) following thawing and fixation after straight freezing. The ultrastructure of the tissue resembles that of a tissue homogenate, rather than that of the molecular layer of the cerebral cortex. Previous cryopreservation techniques have relied on freezing, usually after the introduction of a cryoprotective chemical(s) to reduce the amount of ice being formed. 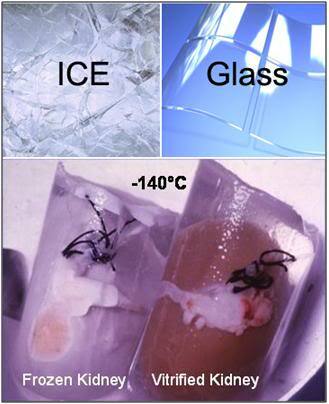 While this technology reduces the amount of freezing injury that occurs when human patients are cryopreserved, there is still a great deal of serious disruption of the fine structure of the brain (ultrastructure) that will require very sophisticated molecular-level repair by a mature nanotechnology – a technology that is likely to be many decades, or even a century or more in the future. Alcor-B’s development of minimal ice, or Near-Vitrification Technology (NVT) all but eliminates damage from ice formation. In fact, in experimental animals subjected to Alcor-B NVT, damaging ice formation is confined to a few small areas of the brain comprising less than 1% of total brain volume. Similarly, NVT, delivered under optimal conditions, results in only approximately 3-5% ice formation in entire body of dogs subjected to this procedure. Under normal conditions, when a living system is cooled, the water in it, which comprises about 60% of its mass, is converted into ice. This ice forms outside of cells, not inside of them, and in the process the cells become dehydrated and shrunken. This dehydration due to ice formation increases the concentration of the salts normally present in body fluids, which in turn causes chemical injury to the proteins and the lipids (fats) that make-up the cells’ structures (Figures 2 & 3). The addition of modest (10-20% w/v) or moderate (20-50%) amounts of cryoprotective agents which do not freeze, and which interact with cellular water to reduce the amount of that water which freezes during cooling, markedly reduces freezing damage. Figure 3: A ribbon model of a protein depicting the kind of conformational changes typically seen in protein denaturation as a result of freezing injury. Figure 4: Above, top, shows a false-color rendering of the normal configuration of membrane lipids and the membrane protein sodium-potassium-ATPase in a bacterial cell membrane. The membrane exhibits a smooth, lamellar character, and there are only a few aggregated and displaced particles of protein evident (yellow granules). In B, at right above, there is evidence of an alteration in membrane structure after the cell has been incubated at ~ -6oC for 1 hour in the presence of 20% w/v dimethylsulfoxide (DMSO). 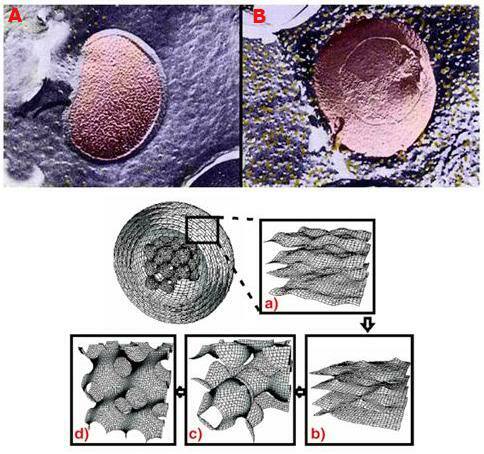 The membrane has developed a pebbly appearance and there are many extruded granules of protein on the membrane surface. The lower illustration (above) is a computer rendering of various lipid phase transitions in a model system (Langmuir trough), some of which result in perforations of the normally lamellar membrane structure. In fact, such “cryo-protection” almost completely eliminates the damage that normally occurs to the lipids and proteins that cells are comprised of. This kind of cryopreservation technique is what forms the basis for the successful freeze-preservation of sperm, blood, bone marrow and many other types of cells and tissues that are amorphous in structure – in other words, cells and tissues where the cells are not attached to each other and organized in a highly structured way. Unfortunately, most multi-cellular animals, including human beings, consist of highly organized and structurally complex aggregations of cells which have specific jobs to do – jobs which can only be carried out if those structures are intact and un-disrupted. Ice formation in tissues can disrupt those important inter-cellular connections, and while the cells themselves may survive freezing and cryopreservation, the function of the tissue or organ is compromised (Figure 5). Over the past two decades a new technology of cryopreservation has emerged and is being perfected. This technology is called “vitrification” (from the Latin vitrum, glass + Latin -fic re, -fy)because it completely suppresses the formation of damaging ice crystals during the cryopreservation process, as can be seen in Figure 6, below. Figure 6: At bottom left a rabbit kidney that has been frozen following treatment with ~ 40% cryoprotectant agents. The kidney was submerged in solution that did not have enough cryoprotective agents present to allow it to vitrify. The kidney has a chalky, opaque appearance is due the presence of large amounts of ice in the tissue. At bottom right is a kidney that has been perfused and equilibrated with sufficient cryoprotectant to allow cooling to -140oC with no ice formation. Because this kidney has no ice crystals in it to refract light, it remains translucent and appears unfrozen – which is in fact the case – even though it has been converted to a solid, glassy state. At top; Even in the everyday world, the difference between ice and glass is clearly visible when the two are compared side by side. This non-frozen glassy solid state is achieved by replacing ~60% of the water in the tissues of an organ, or a whole organism, with a combination of antifreeze molecules that completely prevent ice formation. The technique of vitrification as applied to whole organs is relatively new, and only recently has a whole mammalian organ, the rabbit kidney, been subjected to vitrification and recovered function. However, there are still many obstacles to be overcome before this technology can be routinely applied to organs to allow for the creation of organ banks, wherein a large reserve of organs and tissues can be stored indefinitely, for transplantation. And there are many additional obstacles to be overcome before whole organisms, such as human beings, can be cooled to very low temperatures for stable, indefinite storage. 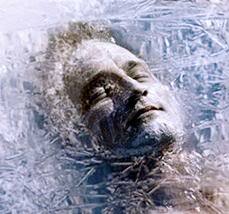 Until suspended animation is developed it is necessary to cryopreserve today’s terminally ill patients with less than perfect techniques. These techniques inflict some injury, but we believe that this injury will be reversible in the future and we have excellent evidence right now that it is reversible, in principle. This is the theoretical underpinning of cryonics – the idea that if we cryopreserve today’s terminally ill patients with the best available techniques, it may well be possible to not only cure the lethal illness the patient is suffering from, but also to cure the damage incurred through the use of still imperfect cryopreservation techniques. However, the damage inflicted by conventional freezing techniques is extensive, and it will take many decades, and perhaps even a century or two, before a mature “nanotechnology,” one capable of effecting repair at the molecular level, is likely to be developed. It would obviously be much better to be able to cryopreserve patients in such a way that the kind of damage being done could be reversed (and the patient restored to life) by biomedical technologies currently under development, and which may well become available within the next 30 to 60 years. Alcor-B has been working relentlessly to develop such a cryopreservation platform and now, after 5 years and expenditure of $3.5 million dollars, we have succeeded. 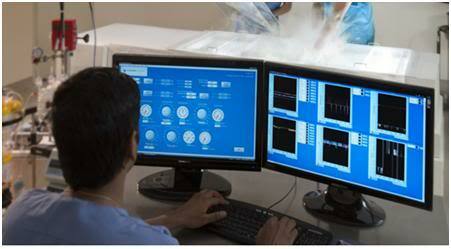 We call this cryopreservation modality Near Vitrification Technology (NVT). NVT is basically vitrification applied to the human body, or the human head in isolation, with the understanding that small islands of tissue will still be undergoing freezing, despite our best efforts to completely suppress ice formation. As you will see in the discussion that follows, the amount of ice that forms is surprisingly low; < 5% of the body as a whole and only ~1% of the brain. It is important to point out that this ice formation is not global in nature, but rather is confined to a few tissues that are poorly circulated with blood under normal conditions, and are thus difficult to equilibrate with a sufficient amount of cryoprotectant to completely inhibit ice formation (Figure 7). It is also important to point out that even where some ice formation does take place and “freezing” occurs, it is freezing in the presence of very high concentrations of cryoprotectant drugs, and therefore the damage is much less than would be the case if freezing were to have occurred in the absence of cryoprotection. To achieve NVT, Alcor-B is using technology similar to that developed by 21st Century Medicine (21CM), a cryobiological research and development company located in Fontana, CA. 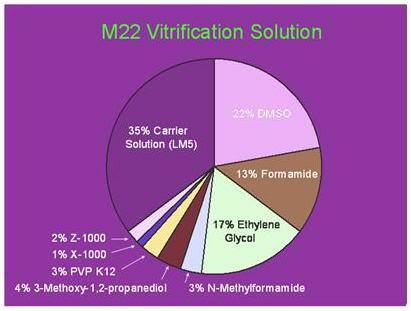 We have used M-22 solution, a vitrification solution developed by 21CM primarily for kidney vitrification. The composition of M-22 is shown Figure 8, below. This complex mixture of antifreeze and actively ice-growth inhibiting (ice-blocking) cryoprotectants exhibits comparatively low toxicity, even at concentrations of ~60%. A unique feature of M-22 is the presence of two synthetic molecules that inhibit ice growth by binding to both the a and c axes of ice. These molecules stabilize the solution against ice nucleation and propagation, allowing for use of the much slower cooling and rewarming rates needed for ice free cryopreservation of large tissues masses, such as humans organs or entire human beings. 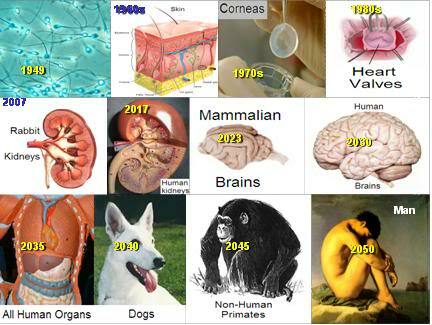 A fair summary of the current technological state of the art with respect to the vitrification of organs for the purpose of developing organ banks is that under ideal (laboratory) conditions it is likely now possible to place complex mammalian organs, such as the rabbit kidney, into indefinitely long suspended animation with little or no loss of viability, and no damage as a consequence of structural disruption due to ice formation. The use of radio frequency, or microwave illumination to speed rewarming, the use of warm gas (such as helium) to perfuse the organ’s circulation, or a combination of these modalities, may offer a workable solution to the problem of ice formation during rewarming. Perhaps most impressively, one mammalian kidney has survived vitrification and rewarming sufficiently intact to permit immediate support of the rabbit from which it was removed (as the sole kidney), until the animal was sacrificed for evaluation 29 days after the organ was re-implanted. Figure 9: The first kidney to survive vitrification shortly before it was removed from the animal for evaluation after supporting its life as the sole kidney for 29 days. It is not possible to directly apply the 21CM vitrification technology to humans, or to the human brain, because of constraints on the rate at which the necessary cryoprotective drugs can be loaded into and unloaded from the brain. Kidneys can be perfused with M-22 to temperatures as low as -20oC, whereas the brain can be perfused only to -3-4 oC. This means that the brain will be exposed to toxicity from the cryoprotectants in the vitrification solution, which cause injury very much like that shown in Figures 4 & 5 above – although much, much less extensively. Alcor-B research indicates that perhaps a total of 25 proteins undergo some kind of denaturation, and that fewer than 20% of the cells in an animal treated with NVT undergo alterations in membrane structure that would interfere with function upon reanimation. Viability studies conducted by Alcor-B indicate that even with extended exposure to M-22 at -3oC, there is recovery of ~40% of pre-preservation viability (as measured by Na++/K+ ratio). Very importantly, two dog brains out of a series of 17, subjected to NVT and stored for 7 and 11 days, respectively, at -130oC, demonstrated brief recovery of electrical activity (EEG). Rabbit brain slices treated with M-22 in the laboratories of 21CM, have demonstrated complete recovery of viability, electrical activity and Long Term Potentiation (LTP). Importantly, LTP is the biochemical change in brain cells currently thought to encode memory. Brain slices in which LTP was induced, by simulating a learning experience with a weak electrical current, were able to ‘recall’ this event following cryopreservation and reanimation. 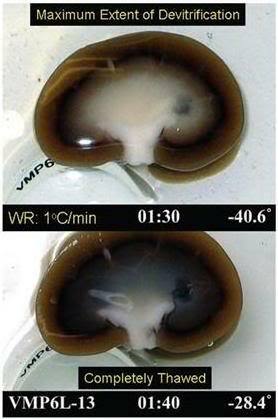 An additional complicating factor in achieving reversible (viable) vitrification of the mammalian brain has been the inability to continue cryoprotectant perfusion at the same subzero temperatures (-20oC) that have proven essential for recovery of rabbit kidneys following loading and unloading with M-22. As can be seen in Figure 10, below, perfusion of the terminal concentration of M-22 is not possible below ~ -3-4oC. 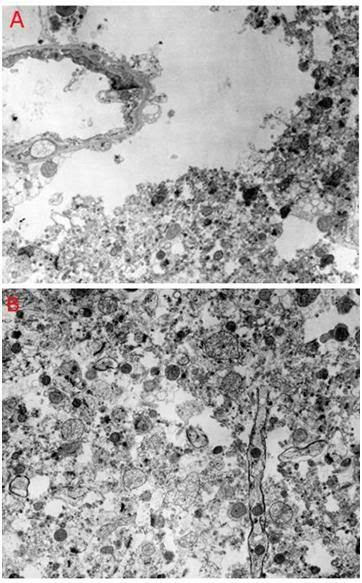 Exposure to ~8.2M M-22 at such a relatively high temperature, for the final ~60 min of perfusion required to load the brain with the CPA mixture, results in major loss of viability, but does not visibly affect brain ultrastructure, as imaged using Transmission Electron Microscopy (TEM). The ultrastructure of dog brains cryopreserved using the 21CM vitrification technique shows no evidence of gross ice formation, as can be seen in the photo at the top of Figure 11, below. Indeed, there is no evidence of ice formation in any of the tissues of the head and neck with simple visual inspection. Figure 11: Dog brains subjected to NVT under optimum laboratory conditions show no visual evidence of ice formation. However, when false-color, polarized light imaging is used, areas of minimal ice formation can be seen. Measurements of the ice content in the brain regions seen to contain ice (as above) using differential scanning calorimetery typically show ice formation in the range of 4-12% of the tissues volume. A=brain, B=space from cryoprotectant-induced brain dehydration, C=spinal cord, D=soft palate. However, if the exposed tissues of the brain and head are subjected to false-color, polarized light imaging, the areas where ice has formed become visible as green, highlighted areas. As can be seen in Figure 11, above, small amounts of ice have formed in several brain areas, as well as in the muscle of the neck, and in the frontal sinus. The rest of the brain appears ice free, fully vitrified, and thus spared any mechanical disruption of the tissues. Figure 12: Sections of the experimental animals were cut at deep subzero temperatures using a specially modified Bright Instruments 8000 (BI-8000) sledge microtome with electro-linear drive (left, above). The modified BI-8000 can section specimens up to 250mm long, and is liquid nitrogen cooled to maintain stable temperatures during sectioning, and to avoid artifact-crystallization due to inadvertent re-warming. The BI-8000 employs a fully automated cutting sequence and an electro-linear drive for high cutting forces. Cut sections were then removed from the BI-8000 and photographed for subsequent analysis of the effects of the NVT procedure on the tissues, including polarimetric evaluation of ice formation (e.g., when and where it occurred). 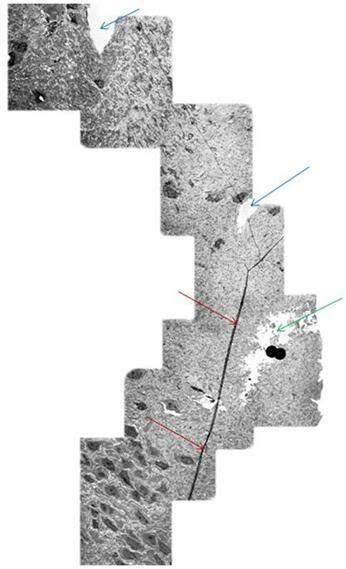 In order to resolve the question of whether or not ice is forming at the cellular and intra-cellular level, Alcor-B has conducted extensive Transmission Electron Microscopy (TEM) studies of animals’ brains subjected to NVT. Exposure to the vitrifying cryoprotectants results in extensive (but fully reversible) dehydration of the tissues (Figure 11) and this makes interpreting the TEM pictures more difficult. Aside from increased density of the ground substance (which is the molecular fabric of the brain) due to dehydration, the brain cells (neurons), their long processes (axons) and their connections (synapses) are intact. As is evident in Figures 13-15, the architecture of NVT treated brains is essentially normal (aside from the cryoprotectant-induced dehydration). Cell membranes are crisp and intact, as are the intra-cellular membranes, including the synaptic vesicles that contain neurotransmitting chemicals. As can be seen quite dramatically above, in Figure 16, the axons are intact over long distances within the NVT treated brains. The areas of open space seen in Figure 15 are not due to ice formation, but rather appear to be tears in the brain tissue resulting from the cryoprotectant-induced dehydration. This is a worrisome problem that Alcor-B is actively working to solve. However, it should be emphasized that such damage does not destroy any information about the structure of the brain tissue. Thus, it should be possible to restore the tissue to its pre-cryopreservation state. It is also the case that micro-tears of this nature occur in concussion and other kinds of closed head trauma and that they are survivable, albeit it often with some cognitive impairment, with even the very limited repair abilities the brain naturally possesses. Figure 17: Hippocampal CA4 cells following recovery from vitrification using a fully reversible, viability conserving technique. Following rewarming and unloading of the CPA the tissue was incubated in artificial cerebrospinal fluid at 35oC for >60 min before being fixed in low-osmolality Karnovsky’s and examined by TEM. Most reassuringly, when brains subjected to NVT are cleared of cryoprotectant and reperfused with a life-supporting physiological solution, the dehydration induced changes in the fine structure of the brain observed in the NVT- state disappear, as can be seen in Figure 17, above. Both freezing and vitrification have the potential to disrupt the structures that encode LTM in ways that would leave them non-infer able. Vitrification may do this by the expedient of altering membrane structure irreversibly by dehydration, or by changing the molecular structure of the membranes (or membrane components) by directly perturbing their structure. Vitrification solution is not water, and water is critical to the structure of many of the molecules inside cells. Indeed, a good part of the science behind designing tolerable vitrification solutions is to make them behave as much like water as possible – while at the same time behaving as good, or good enough, glass forming agents when cooled.On a purely structural basis it would seem that vitrification, applied under ideal (laboratory) conditions, is preserving the structures that encode memory and personality. To the extent that structural vitrification (as opposed to fully reversible, viable vitrification) perturbs or damages the biochemistry associated with LTP, there are grounds for concern. However, it seems unlikely that such injury would render the biochemistry of the brain non-infer-able, and therefore nonviable. In 1983, studies were undertaken by Alcor-B to determine the effects of 30 minutes of normothermic ischemia followed by 24 hours of cold ischemia at ~ 2-4oC. Healthy adult cats were anesthetized; heparinized and cardiac arrest was induced. The animals were allowed to remain undisturbed on the operating table for 30 minutes, and then were packed completely in water ice, where they were allowed to remain for 24 hours. They were then perfused to 4 M glycerol using a linear increase in glycerol concentration during the ~ 60 minute perfusion interval. Following cryoprotective perfusion, the animals were cooled to dry ice temperature at ~ 3oC/hour, and to liquid nitrogen temperature at ~4oC/hour. 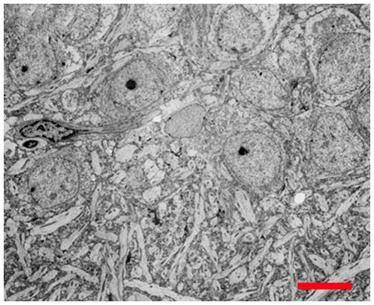 Due to the unexpected presence of fracturing in the brain and other viscera, fixative reperfusion following thawing was not possible, and brain tissue samples for TEM were fixed by immersion. As can be seen in Figure 18, above, there was extensive freezing damage superimposed over ischemic injury to the tissue. The mitochondria were swollen and often showed little internal structure. Neuronal plasma membranes were impossible to identify and the neuropil was macerated by what appeared to be ice artifacts. Large peri-capillary ice holes were almost uniformly present and large islands of tissue had the appearance of a tissue homogenate, as was observed in animals subjected to straight freezing. We thus wish to emphasize that for cryonics patients to obtain the maximum benefit from NVT, they must present for care immediately upon cardiac arrest, so that procedures can be undertaken to minimize the effects of lack of blood circulation on the brain and other vital organs (Figure 19). Figure 19: Ideally, immediately following the pronouncement of medico-legal death, circulation and respiration are restored by mechanical means while the patient is rapidly cooled. Medications to protect the brain against damage from lack of blood flow (ischemic injury) are also administered at this time. A new technique for cooling employing chilled liquid perfluorocarbon cycled in and out of the patient’s lungs allows for even faster cooling of the brain (~0.5 oC/min). As shown in Figure 19, above, care of Alcor-B cryonics patients commences the instant that medico-legal death is pronounced. Circulation and respiration are temporarily restored by mechanical means, initially employing chest compressions and mechanical ventilation. Cooling is also initiated at this time; both externally, and by the infusion of cold fluids into the abdominal cavity as well as chilled perfluorochemical into the lungs. 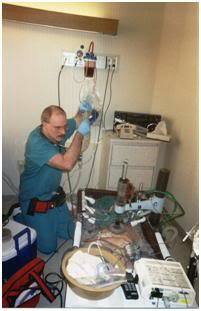 Cooling using these technique can approach that achievable with cardiopulmonary bypass (1.0oC/min) for the first 10 minutes of closed-chest cardiopulmonary support. 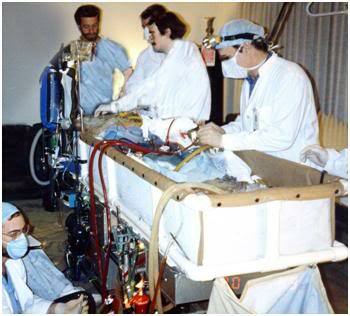 Figure 20: The Alcor-B extracorporeal membrane oxygenation, or ECMO cart, being used to provide circulation, gas exchange and cooling to a cryonics patient who has experienced medico-legal death in his home, under the care of home hospice. As soon as possible, usually with 45-90 minutes of the onset of cardiac arrest, circulation and gas exchange are taken over by the use of a blood pump and a membrane oxygenator (extracorporeal membrane oxygenation, or ECMO). ECMO allows any deficits in artificial circulation or ventilation due to organ failure (such as fluid accumulation or tumor in the lungs) to be side-stepped, and it also allows for far more rapid cooling, typically in the range of 1oC/min all the way down to a few degrees above freezing. The Alcor-B ECMO cart is shown in Figure 20, above. 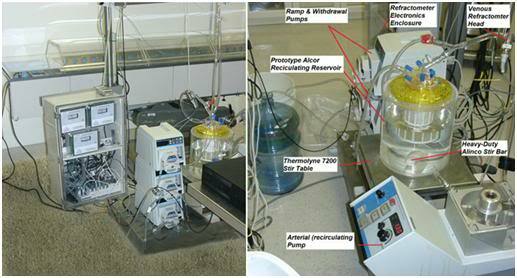 Figure 21: At left above are the process control refractometrs (inside perspex fronted cabinet) which monitor the concentration of cryoprotectants going into (arterial) and coming out of (venous) the patient. The data stream from these refractometers feeds into the cryoprotective perfusion and cooling control computer. Next to the refractometers are the cryoprotectant addition pump and the recirculating perfusate withdrawal pump. The third pump is for ‘cardiotomy suction’ to recover perfusate leaking into the chest wound and return it to the circuit. At right above is the recirculating and mixing reservoir (yellow top) sitting atop a magnetic stirring table. A magnetically driven stir bar mixes the concentrated cryoprotectant solution with the much more dilute perfusate being recirculated through the patient. Once the patient has been stabilized and temporarily protected against further ischemic injury, he is transported to Alcor-B’s facilities for cryoprotective treatment and cooling to -150oC for long term care. The introduction of cryoprotectants is carried out using a sophisticated, computer controlled perfusion system developed in-house by Alcor-B. The key elements of the cryoprotectant introduction circuit are shown in Figure 21, above, and in schematic form in Figure 22, below. Two low capacity pumps deliver cryoprotectant to the perfusate being recirculated through the patient, and withdraw fluid from the circuit – fluid containing water from the patient’s tissues – which is discarded. 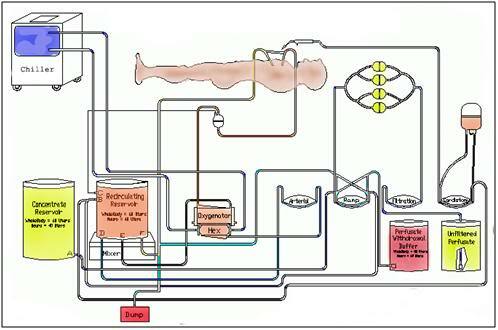 Figure 22: A schematic diagram of the extracorporeal circuit used to replace ~60% of the water in a cryonics patient’s body with vitrification (cryoprotective) drugs. The process of cryoprotective perfusion requires very careful control over not just the pressure and the flow rate of the cryoprotective solution through the patient’s circulatory system, but also of the temperature. The toxicity of the cryoprotective drugs is a function of both their concentration and the temperature at which they are introduced. The lower the temperature; the lower the toxicity of the cryoprotective agents. That is why, in order for the rabbit kidney to recover from cryoprotectant loading to a vitrifiable concentration of cryoprotectant, the final phase of introduction must be carried out at -20oC. 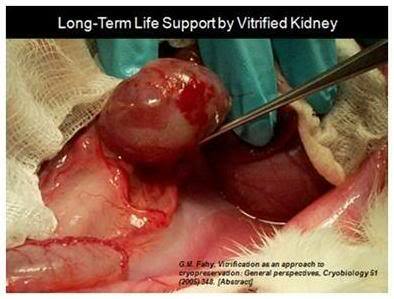 If this is done, 100% of kidneys treated with a vitrifiable amount of M-22 cryoprotectant will recover completely, and support the animal as the sole kidney after re-implantation. 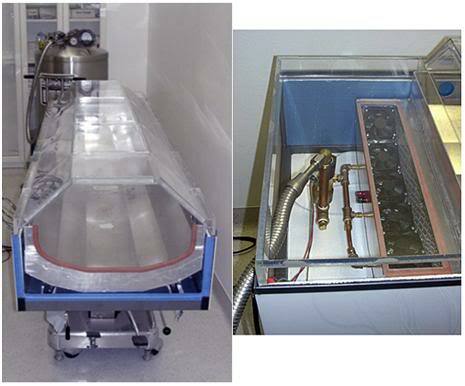 Figure 23: At left, above, is the controlled temperature enclosure for cryoprotective perfusion of the patient and cooling to -150oC. The contoured aluminum module on which the patient rests is the bottom half of the protective pod that will enclose the patient during long-term cryogenic storage. Once perfusion and deep cooling are complete, the pre-cooled upper half of the patient pod is attached and the patient is transferred to long-term storage. At right, above, is close-up view of the liquid nitrogen (LN2) vapor circulating fans and the LN2 dispensing manifold. A solenoid, under computer control, open and closes the valve to the LN2 reservoir to maintain the temperature at the desired point. However, as previously noted, it is not yet possible to introduce M-22 into mammalian brains at such a low temperature. Nevertheless, it is still very important to control the temperature precisely and to keep it as low as possible during cryoprotectant loading. The current procedure for perfusing cryonics patients with M22 is to wash out the blood with a specially designed carrier solution called B1, and then continue perfusion with B1 at ~+3.5oC. Over a period of ~90 minutes, a concentrated form of M22 (125%) is gradually added to effect a linear increase in concentration in the perfusion circuit in order to allow the patient’s cells adequate time to equilibrate, and thus avoid injury from too much cellular dehydration. When 50% of target concentration of M-22 is reached, there is a pause in the addition of M-22 to the circuit, again in order to allow time for cryoprotectant to equilibrate more completely, and also to allow for the patient’s temperature to be reduced to -3oC. When the venous and arterial concentrations of M-22 are roughly equal, the concentration of M-22 is rapidly increased to 100% of the target concentration. This is done in order to minimize the toxic effects of the cryoprotectants that would occur if they were introduced at these (high) concentrations at temperatures at or above 0oC. At this point, the arterial concentration is held between 100% and 105% as long needed, but not exceeding 5 hours, until the concentration of M-22 in the venous perfusate reaches 100% of the target concentration. Figure 24: Once the patient is connected to the cryoprotective perfusion system and flushed with B1 carrier solution, the control of all parameters of cryoprotective perfusion is assumed by the computer. Arterial and venous pressures, perfusate flow rate, cryoprotectant concentration increase and all temperatures are under computer control. This is necessary because the rapid changes to these parameters that are required to minimize perfusion time and reduce toxicity by keeping the patient’s temperature just above the freezing point of the cryoprotectant-water mixture in his tissues cannot be managed by humans – we’re too slow – and too easily distracted. Control over the temperature of the patient, and the perfusate flowing through his circulatory system, is achieved by the use of a sophisticated, computerized temperature controlled enclosure, in addition to the computerized perfusion system already described. This enclosure was developed by Alcor-B, and is shown in Figure 23, above. The refrigerated enclosure is cooled by liquid nitrogen vapor and it can maintain the patient’s temperature at any desired point between +15oC and -150oC. This means that when cryoprotective perfusion is completed, the patient can be cooled, in place within the enclosure he was perfused in, all the way to his long-term storage temperature of -150oC. The entire perfusion and cooling to storage procedure are completely automated and continuously monitored by Alcor-B’s highly trained cryo-biomedical staff (Figure 24). Figure 25: Long-term cryogenic storage is carried out using a newly developed technology known as intermediate temperature storage (ITS). ITS holds the patient at a temperature of ~ -150oC, which is a sufficiently low temperature to stop all biochemical activity, and yet not so cold that it could cause fracturing in the patient’s tissues. Figure 26: Quality control and validation of our procedures is critically important to Alcor-B. For that reason we treat each human case as an experiment; an undertaking to be carefully documented and to be learned from. At left above is an Alcor-B patient following cooling to -150oC. The chalky white areas present on the skin are areas where ice formation has occurred. 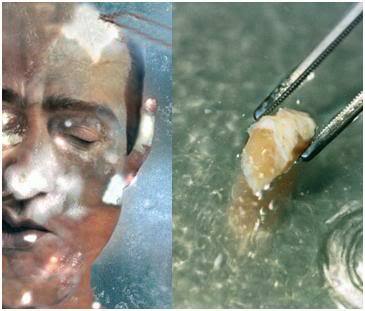 The rest of the patient’s skin appears somewhat translucent and is not frozen, but rather is vitrified – converted into a glassy state. At right is a section of spinal cord taken from an Alcor-B neuropatient (i.e., a head-only patient). 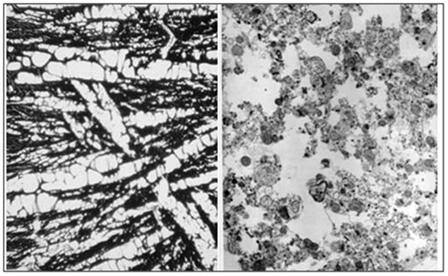 This section of cord is completely free of ice and demonstrated normal ultrastructure for tissue subjected to NVT, as can be seen in Figure 28, below. Alcor-B is not content to rely solely on animal experiments conducted under ideal laboratory conditions; we have carried out careful examinations of patients undergoing NVT both during cooling, and after 8 months of storage, in order to evaluate the amount of superficial freezing that is occurring. As can be seen at left in Figure 26, above, there is always some ice formation in the skin of NVT patients, which is typically associated with peri-cardiac arrest trauma, or with injury to the skin secondary to the placement of temperature probes and the creation of “monitoring widows” in the skull. This ice formation is not of concern, and the amount of ice formed in the skin is within survivable limits for that tissue. Figure 27: At left above is a dog treated with NVT under ideal conditions of 5 minutes of cardiac arrest at normal body temperature followed by 45 minutes and closed-chest CPS and then extracorporeal cooling to 10 oC. 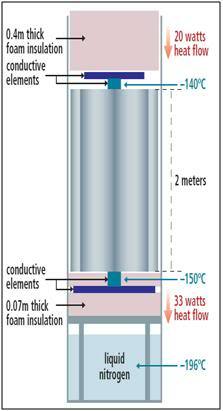 Cryoprotective perfusion was then carried out followed by cooling to -150oC and solidification. There is no visible ice and the animal presents the appearance of being uniformly equilibrated with cryoprotective solution. At right, above, is a dog which experienced cardiac arrest followed by cooling with ice bags. Blood washout and cryoprotective perfusion were not initiated until 18 hours after the start of both cardiac arrest and external cooling. 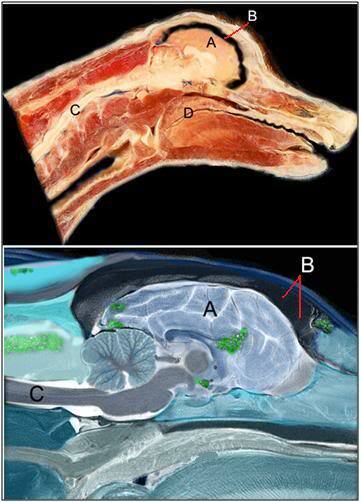 This animal underwent freezing and the distribution of cryoprotective agents was very inhomogeneous in the brain and in the skeletal muscle and other tissues. We have conducted many experiments simulating the non-ideal conditions to which cryonics patients are sometimes subjected and we have also taken non-vital samples from human patients in our care that have been treated under a variety of conditions, ranging from optimum, to highly undesirable (Figure 27). In patients treated under ideal conditions, with only a few minutes of ischemia between the time of cardiac arrest (and the pronouncement of legal death) and the start of the procedure, the spinal cord is uniformly vitrified, as is evident in at right in Figure 26, above. 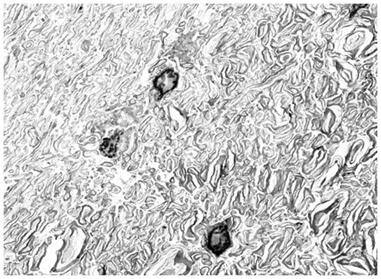 TEM examination of tissue taken from patients treated under such conditions is indistinguishable in appearance from that observed in experimental animals (dogs) subjected NVT (Figure 28). Examination of the surface of the brain through the two observation windows (burr holes) made in the skull at the start of the procedure also show no evidence of ice formation when a patient is treated with NVT under ideal conditions. Figure 28: Above are gray (left) and white (right) matter from the spinal cord of an Alcor-B neuropatient who underwent NVT under optimum conditions. The gray matter (left) shows two normal appearing capillaries and dehydrated, but otherwise normal fine structure. The white matter (right) shows more dehydration from cryoprotection. The interiors of the axons (axoplasm) are shrunken and the myelin sheaths that surround the axons have a rumpled and somewhat unraveled appearance. Alcor-B is currently conducting research to try to overcome these problems. Despite these admittedly undesirable alterations, the overall structure of the spinal cord appears beautifully preserved. Figure 29: Patients treated with NVT & ITS may be recoverable before this century’s end using biologically derived organogenesis and tissue repair technologies. This offers considerable risk reduction and improved odds that cryopreservation will be successful. With the advent of NVT and ITS technology, Alcor-B is now able to cryopreserve patients in a state of near viability, with little structural injury. It is conceivable that patients so treated may be recoverable before this century’s end, if the pace of biomedical advance continues at the rate that it has over the past five decades. The ability to recover cryonics patients within the limits of normal corporate and human undertakings (i.e., 60 to 90 years) offers a tremendous reduction in the degree of risk to which the patients are subjected. For example, very few business entities of any kind survive long-term. Even non-profit organizations (NPOs), such as Alcor-B, have a ~95% failure rate by the 30 year mark, and of those that survive to 30 years, only ~1 % will survive to 100 years. 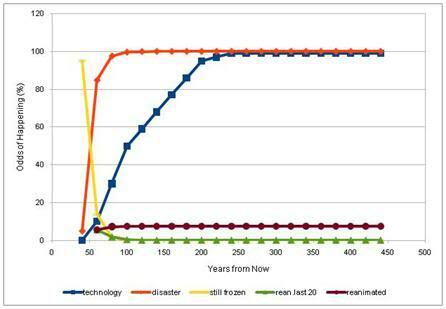 Using a very simple model of the impact of institutional failure on the chances of recovery from cryopreservation, and (approximately) applying the historical NPO failure rate, the chances that a person will be recovered from cryopreservation over a 100 year period of storage are only 8%. This outcome does not consider other risks, such as government proscription of cryonics, or existential risks, such as fire, flood, earthquake, pandemic disease, etc. Very importantly, it also does not take into account the probability that existing cryopreservation procedures may not be sufficiently advanced to allow for recovery of today’s patients (the default assigned autopsy risk is 5%, which is also quite low). Given such a high probability of failure solely from lack of institutional continuity, it should be clear why so many people, especially those who are knowledgeable and world-wise, fail to find cryonics sufficiently attractive to commit to it personally. Figure 31: Alcor-B’s timeline to achieving fully reversible suspended animation for both the human brain and the intact human. This is one of the principal reasons that Alcor-B is working so hard to improve the quality of cryopreservation, and to ultimately achieve fully reversible suspended animation. While the current odds of cryonics working are anything but good, we strongly believe that we can change that situation. With our commitment to research to achieve suspended animation, and our deep commitment to achieve truly long-term institutional stability, we believe cryonics will become an increasingly attractive choice. We invite you to join us in our effort to break the limiting chains of time and open a future for all of humanity that is as potentially limitless in time, as it is boundless in space. 1. Deutsch D: The Fabric of Reality: The Science of Parallel Universes and Its Implications New York: Penguin; 1998. 2. Tegmark M: Paralell Universes: http://space.mit.edu/home/tegmark/PDF/multiverse_sciam.pdf. Scientific American 2003(May, 2003):41-51. 3. http://www.sciencedaily.com/releases/2009/12/091210092005.htm. Science Daily 2009. 4. 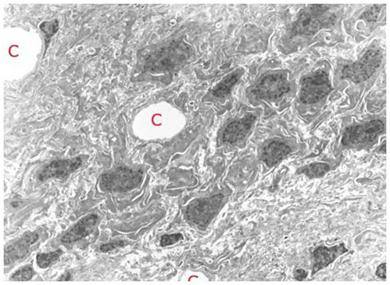 Darwin M, Russell, S, Wakfer, P, Wood, L, Wood, C.: Effect of a human cryopreservation protocol on the ultrastructure of the canine brain. (Originally published by BioPreservation, Inc, as BPI Tech Brief 16 on CryoNet and SciCryonics, May 31, 1995), http://wwwalcororg/Library/html/braincryopreservation2html and http://wwwalcororg/Library/html/braincryopreservation1html 1995. 5. Fahy G, Wowk, B, Pagotan, R, et al. : Physical and biological aspects of renal vitrification. Organogenesis 2009, 5(3):167-175. 6. 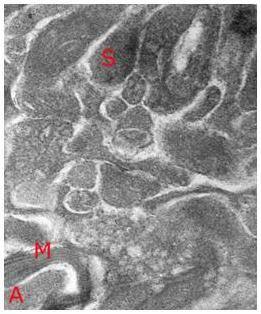 Pichugin Y, Fahy, GM, Morin, R.: Cryopreservation of rat hippocampal slices by vitrification. Cryobiology 2006, 52(2):228-240. 7. Darwin M, Leaf, JD. 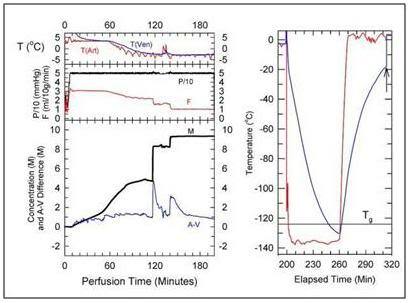 : Cryoprotective perfusion and freezing of the ischemic and nonischemic cat: http://www.cryonet.org/cgi-bin/dsp.cgi?msg=1389, http://www.cryonet.org/cgi-bin/dsp.cgi?msg=1390, http://www.cryonet.org/cgi-bin/dsp.cgi?msg=1391, http://www.cryonet.org/cgi-bin/dsp.cgi?msg=1392 See also: Federowicz, MG. and Leaf JD. Cryonics. issue 30, p.14,1983. 1983. 8. Darwin M, Russell, S, Rasch, C, O’Farrell, J, Harris, S.: A novel method of rapidly inducing or treating hypothermia or hyperpyrexia, by means of ‘mixed-mode’ (gas and liquid) ventilation using perfluorochemicals. In: In: Society of Critical Care Medicine 28th Educational and Scientific Symposium. vol. 27. San Francisco: Critical Care Medicine; 1999: A81. 9. de Wolf A: Vitrification agents in cryonics: http://www.depressedmetabolism.com/2008/07/08/vitrification-agents-in-cryonics-m22/. 2008. Fahy, G.M. “A personal view of the Alcor research fund-raiser.” Cryonics, Volume 12, December 1991,Â Issue 137, pp. 13-14. This entry was posted in Cryobiology, Cryonics Philosophy, Cryonics Technology (General), Culture & Propaganda, Perfusion, Philosophy. Bookmark the permalink. I’m confused. I found this blog post via StumbleUpon and I can’t tell what is real and what is fiction. Seems like a good bet the “facts” that have references are real and I’ve done some Googling re Alcor & cryonics. Still, I can’t figure out what is fiction and what isn’t? Why the SciFi story format?